Online investors use earnings reports to make investment decisions. Your stock’s ultimate value will be determined by how profitable the company is in the long term. Earnings reports tell you how much the company made during the quarter. The report contains all the vital financial results for the quarter, including the net income and earnings per share, which is how much of the company’s profit you can lay claim to as a shareholder. Investors and online databases usually use the shorthand term EPS when referring to earnings per share. If you see the abbreviation EPS TTM, that means earnings per share over the trailing, or past, 12 months. All public companies that trade on major exchanges, such as the New York Stock Exchange and NASDAQ, are required to tell investors how they did during the quarter. These earnings reports can be incredibly important to investors in the short term. Financial news Web sites: Yahoo! Finance and USA TODAY provide the earnings reports directly from the companies as soon as they’re published. Earnings releases are easy to find because in the list of news stories, they’re usually tagged as being from one of two sources: PR Newswire or Business Wire. These reports are very formal and written in almost legalese language. They describe how the companies did, in exhaustive detail, and provide the quarterly financial statements. If you don’t want to take the time to pick apart the company releases, look for earnings stories written by the wire services, such as Reuters and The Associated Press. These stories are analyzed by reporters trained to look for the important things and put their findings in plain English. Wire stories are also available on most financial news sites. Press release distribution services: Most companies hire one of two companies — either PR Newswire or Business Wire — to electronically distribute their earnings press releases. Both these sites let you search press releases that might have been released by different companies. The regulators: You can get earnings reports, called 10-Qs, directly from the Securities and Exchange Commission. The 10-Qs are the official reports, so they usually take a few days to be released. Prior to that, the company must file an 8-K report stating that it put out a press release with quarterly earnings information. 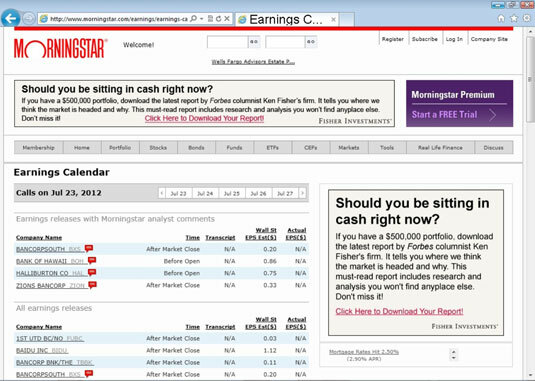 *Earnings calendars: Earnings calendars like the one maintained by MorningstarBigCharts let you see what companies have reported their earnings most recently. For some companies, you can also read brief comments by Morningstar analysts on what investors should look for in the reports.